"Damn, badgers! Get offa mah lawn!" "AIIIEEEEEE! Get 'em off me!!!!!" Something else to be wary of during full moons. HA, THE CAT IS TELLING TEHM "I HAZ SHARP CLAWS BICHES!!" Weird thing is that we have these Gamma World-sized raccoons and possums show up to eat the cat's food on our side porch every third night or so. Looks a whole lot like this. Freaks my dog out. I need to stop rolling those ones. ...quite literally if you're not careful. The European badger is one of the fastest, most powerful diggers in the animal kingdom. Their setts have undermined buildings with walls 3' thick. This puts me in mind of using giant badgers as siege engines. Would you want to face a 10' version in a confined space? @chris Badger Sapper Corps - great idea. I wouldn't want to face a 10' version of Badger in any space. @GSV reminds me of the mind mice in Planescape: Torment, love that handle too. @ckutalik move to the city were it's safe! @ anon I hadn't even noticed the cat, failed spot check I guess. 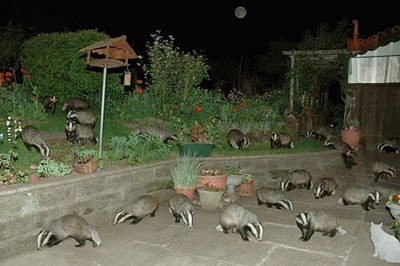 Looks like 22 badgers to me, possibly another one next to the house under the shed thing. And that's just what you see in the shot. Was this a really good roll on 4d6, or was the encounter listing for 4d10 badgers? Scary! By the way if you find a picture with several dozen giant ticks I would be interested, my group has had troubles you see. > Where was this taken? From a safe distance and more than once (hint).